EXCLUSIVE! Rise at dawn to look for fairies in the garden, wash in the May Day dew - indulge in a little springtime magic. A little bit fanciful, this dress adds some fun to your day. Light and dark threads weave a subtle plaid in vivid rose-violet. 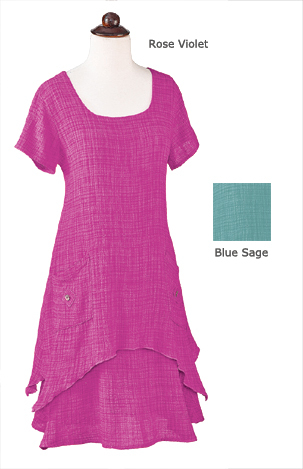 Two gauzy, lightweight layers - top layer has curved handkerchief hem for flutter and twirl. Two patch pockets for collecting flower petals. 36" long. Cotton/rayon; machine wash. Made in USA by Color Me Cotton. Sizes XS-XXL. Also available in Blue Sage. Love the dress. The length is good. Love the way it falls. Soft fabric.